Two thousand twelve was a cool, late year in the Gimblett Gravels Winegrowing District, a favored area within the greater Hawkes Bay appellation on New Zealand’s North Island. Growers there had to pick carefully between rain events. But my recent tasting of a small selection of wines from this intriguing growing area, whose Syrahs I have been following with great interest for the past ten years or so, showed that the most conscientious producers can succeed in Gimblett Gravels even in challenging vintages. 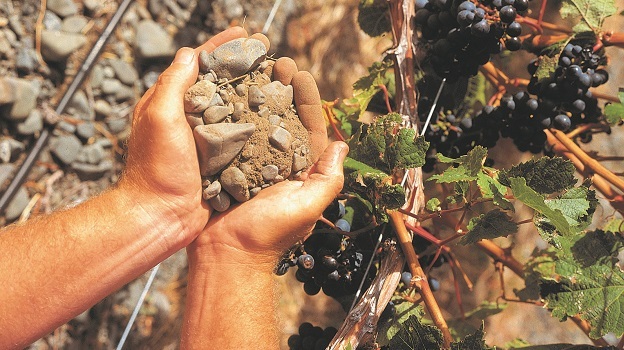 What’s so special about Gimblett Gravels? In terms of climate, Hawkes Bay (frequently spelled Hawke’s Bay) is somewhat analogous to Bordeaux, but without quite as much afternoon heat during the peak of the ripening season owing to cooling sea breezes that begin by noon on most summer days. So while the area is too warm for growing Pinot Noir, it’s generally on the cool side for making wines from Bordeaux red varieties and Syrah. But in the Gimblett Gravels, situated barely 30 meters above sea level and less than ten miles inland, afternoon temperatures are routinely 1 to 3 degrees Centigrade higher during the summer and fall. The area’s gravelly soils also play a critical role in ripening the fruit, warming up early in the spring and releasing stored-up heat at night during summer. This combination of factors helps late-ripening varieties like Cabernet Sauvignon and Syrah achieve full maturity. The long, steady ripening produces wines with good density and aromatic complexity, along with the acid/tannin structure to support positive evolution in bottle. 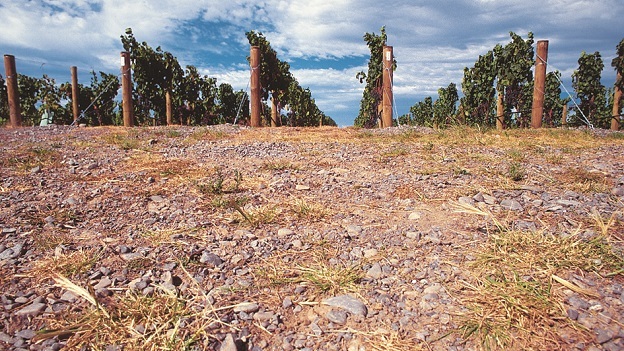 Gimblett Gravels is one of the only wine-growing zones in the New World defined solely by soil type. This was made possible when the Ngaruroro River changed its course in 1867 as a result of a major flood. Where the river previously flowed through the Omahu channel, vines are now planted in low-fertility stony/gravelly soils (with various pockets of sandstone, silt and clay) that benefit from extremely good drainage. Viticulture here dates back only to the late 1970s. 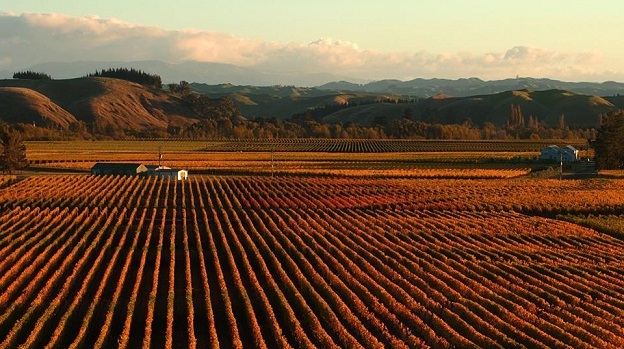 Once a handful of local growers succeeded in producing some of the best claret-style and Syrah wines in New Zealand, 34 companies launched the Gimblett Gravels Winegrowing District in 2001 to define and market their distinctive area. The limited water-retaining capabilities of the soil here require irrigation. Carefully controlled drip irrigation and crop thinning allow farmers to ripen their fruit up to 10 days earlier than would otherwise be possible. In addition, some “terroir manipulation,” particularly leaf-pulling but also strategic row and vine spacing and selection of the right rootstocks and harvesting strategies, are commonly used to expose the fruit to more sun and heat and to eliminate excessively herbaceous qualities in the grapes. Of course, an element of greenness is part of what energizes these wines and gives them their personality. What do the wines taste like? Rather than presenting a distinctive flavor profile, the wines impress by virtue of their aromatic lift, medium weight, balance and wide range of aromatic elements. For more than a decade I’ve been intrigued by the elegant Syrahs I’ve tasted from the Gimblett Gravels, which in their combination of fruits, flowers, pepper and spices remind me of lighter examples from the northern Rhône Valley. This range of aromas was doubtless preserved—or even exacerbated—by the cool, long 2012 growing season, which yielded wines with lower-than-average potential alcohol levels. (But even the warmest years here are not so hot as to result in dangerous loss of natural acidity in the grapes and jammy, dried-fruit flavors.) The 2012s I sampled are graceful wines: while the lighter ones do not appear to have quite the material to expand significantly and become more interesting with cellaring, those that are more concentrated and phenolically ripe should gain in texture and complexity with time in bottle. These wines are much more European in style than the overwhelming majority of New World wines. By all accounts, incidentally, 2013 was an outstanding vintage in this region, providing fuller and more generous versions of these wines without heaviness or high alcohol, and I look forward to reporting on these wines in much greater detail later this year. Following are the wines I tasted this winter. Note that at this point, not all members of the Gimblett Gravels Winegrowers Association indicate their appellation on the front label. Some simply mention the place name in small print on their back labels—or not at all! Alluviale 2012 Red Wine Hawkes Bay: (a blend of Merlot and Cabernet Sauvignon): Bright, dark red. Inviting aromas of currant, blackberry, espresso and chocolatey oak. Vinous and fresh, showing a fine-grained texture and attractive early balance to the concentrated berry, mocha and gravel flavors. Finishes ripely tannic, spicy and persistent, with an intriguing touch of saline minerality. 90/Drinking window: 2018-2024. Babich 2012 The Patriarch Hawke’s Bay Premium Red Wine: (56% Malbec and 44% Cabernet Sauvignon) Good bright, dark red. Aromas of currant and milk chocolate are complicated by menthol and pepper nuances. Pliant and moderately concentrated, showing good lift and delicacy but also a slightly peppery herbaceousness that gives the middle palate a green edge in the early going. Boasts very good vinosity but will this midweight blend round out with bottle aging or will it lose its subtle sweetness first? 87/Drinking window: 2015-2020. Babich 2012 Irongate Cabernet Merlot Franc Gimblett Gravels: Moderately saturated medium red. Pure but subdued aromas of redcurrant, cherry, underbrush, mocha and toffee, with some very ripe notes lurking. Plush and pliant on the palate but more about spices, herbs and meat than primary fruit. Finishes with broad, dusty tannins and a slight green edge, but this rather Euro-styled wine shows good juiciness and intensity. 89/Drinking window: 2016-2020. Unison 2012 Gimblett Gravels’ Selection Cabernet Sauvignon/Merlot: Full medium red. Musky reduced aromas of redcurrant, strawberry, mocha and mellow oak. Smooth in texture but also juicy and firmly built, with a solid spine of acidity supporting and extending the red berry and spice flavors. Finishes with slightly edgy, firm tannins, a touch of herbs and lingering perfume. 88/Drinking window: 2017-2021. Villa Maria 2012 Reserve Cabernet Sauvignon/Merlot Gimblett Gravels Hawke’s Bay: Deep, bright red with ruby tones. Smoky dark fruits, licorice pastille, violet and a whiff of espresso on the nose. Rich and vinous if still a bit youthfully unyielding, with dark berry, pepper and mint flavors framed by harmonious acidity and complicated by Cabernet herbs and pepper. Finishes with serious dusty tannins, good subtle complexity and slowly mounting length. The tightest of this group of wines from Bordeaux varieties: will it blossom with time in bottle? 90+/Drinking window: 2018-2026. Craggy Range 2012 Single Vineyard Syrah Hawkes Bay Gimblett Gravels: Bright, dark red-ruby. Piquant peppery lift to the aromas of blackberry, licorice, cedar and bitter chocolate. Juicy, primary and youthfully imploded, with unyielding purple fruit flavors complicated by pepper and soil nuances. Finishes uncompromisingly dry and austere: will this Syrah unclench with time in bottle? 89+/Drinking window: 2018-2023. Mission Estate Winery 2012 Gimblett Gravels Reserve Syrah: Good medium-deep red with ruby highlights. Complex, soil-driven aromas of dark berries, bacon fat, spices and mocha. At once fine-grained and energetic, boasting lovely inner-mouth perfume to its flavors of spicy red berries and smoke. Nicely filled in from day one. Finishes savory and long, with an even dusting of tannins, a restrained sweetness and complex lingering notes of dark berries, truffle and black pepper. This juicy, nicely balanced Syrah may be in the process of shutting down in the bottle. 90+/Drinking window: 2017-2022. Sacred Hill 2012 Deerstalkers Syrah Hawke’s Bay: Healthy dark red. Classic cool-climate Syrah aromas of violet, pepper, smoked meat and dark chocolate. Tightly coiled but not at all hard, showing a sappy core of savory dark berry and spice flavors. There’s an almost chocolatey ripeness to this tactile wine but it’s classically dry too, showing captivating pepper and smoke qualities and a very firm finish that argues for patience. 90+/Drinking window: 2018-2024. Squawking Magpie 2012 Stoned Crow Syrah Gimblett Gravels Hawkes Bay: Good dark red. Aromas of redcurrant, mocha and smoke are complemented by mellow oak tones. Tightly wound and savory, showing little in the way of easy sweetness to its flavors of currant, spices and chocolate. Ultimately a pliant wine but I wanted more concentration. Good lingering perfume suggests that this wine will be better for a little patience. 88+/Drinking window: 2018-2022. Trinity Hill 2012 Syrah Gimblett Gravels Hawkes Bay: (just 12.5% alcohol on the label, and 12.0% on the accompanying tech sheet): Medium red. Musky perfume of red and black berries, spices and green pepper. Juicy, savory and smaller-scaled; conveys a slightly green quality and a flavor of underripe raspberry but melts on the palate. Finishes with dusty tannins. Will this wine expand with time in bottle? Reminded me of some undernourished low-alcohol Syrahs from the Sonoma Coast. 88/Drinking window: 2016-2019. Unison 2012 Gimblett Gravels Syrah Hawke’s Bay: Good medium red. Musky raspberry and mocha on the nose, dulled by some nutty oak tones. Lush, broad and smooth on the palate, but with a slight green edge to the flavors of raspberry and mocha. Better in the mouth than on the nose but still a bit medicinal: I wanted more nuance. Finishes with smooth tannins and a firming edge of acidity. I’m not wild for this wine’s oak element. 89/Drinking window: 2016-2019. Villa Maria 2012 Reserve Syrah Gimblett Gravels Hawkes Bay: Bright, deep red with ruby highlights. High-pitched, primary aromas of blackberry, bitter chocolate, violet and spices. Densely packed and youthfully imploded, with flavors of macerated dark fruits complicated by musky, slightly sauvage coffee and leather notes and a resiny element. Firm-edged but not hard. Like the Villa Maria Cabernet/Merlot blend, this wine stood out in my group tasting for its dark color and primary fruit character. The tannins are firm but not green on the savory finish. Not for drinking now, but has the balance to support a leisurely evolution in bottle. 91+/Drinking window: 2019-2025.